In the last issue we shared the results from the Masterteam, Table Tennis and Chess Finals and now we conclude our roundup with the results of the Badminton and Football competitions. The 65th Edinburgh made it three years in a row by winning the National Badminton Final in Leicester on Saturday 29th April. After a long competitive day of some excellent Badminton, the 65th Edinburgh were triumphant against 4th Newtownabbey in the final at The Roger Bettles Sports Centre in Leicester. Six teams from around the Brigade had qualified for the final including 65th Edinburgh, 1st Largs, 1st Garvagh, 4th Newtownabbey, 32nd Nottingham and 9th Southend. 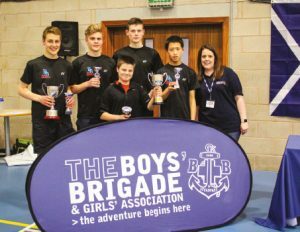 The winning team of Peter Sawkins, Jason Wang, Lucas Johnston, Liam Packwood & Sam Raphael were presented their individual trophies and the Competition Trophy by Natalie Whipday, Director for England & Wales. The 15th South Shields team won four of five matches to clinch the 2016 – 2017 title at an event hosted by Glasgow Battalion on 22nd April. The team, who were runners-up in last year’s finals, topped the table above second place team, 4th Newtonabbey. 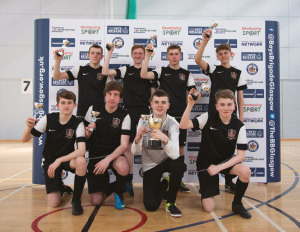 The winning team consisted of James Ingoe, Daniel Gray, Jordan Capeling, Harry Edwardson, Samuel Ingamells, Luke Walker, Jordan Brindle and Harry Ludlow. 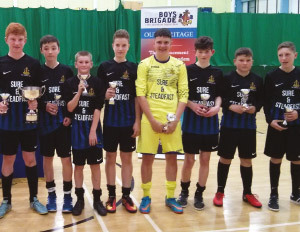 This year’s finals saw six teams – 15th South Shields, 4th Southampton, 2nd Gourock, 1st Buckie, 5th Carrickfergus and 4th Newtownabbey – competing at the Alistair McCoist Complex, East Kilbride. The finalists were welcomed by the Depute Provost of South Lanarkshire Council, Pam Clearie and the boys from 15th South Shields were presented with the trophy by Brigade Vice President, Alistair Burrow and Director for Scotland, John Sharp. The 1st Kilkeel Company from Northern Ireland won this year’s title following a fantastic day of football at the Valley Leisure Centre, Newtownabbey on Saturday 13th May 2017. This year’s finals saw six teams taking part including the 1st Kilkeel, 1st Moneymore, 2nd Gourock, 1st Banff, 2nd Tonbridge and 14th West Bromwich.